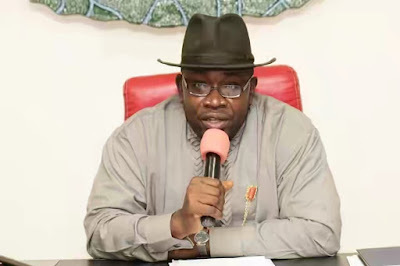 Governor of Bayelsa State, Seriake Dickson, has approved automatic employment for 107 PhD and 200 MSc degree holders who have concluded their studies under the state scholarship scheme. Governor Dickson also announced the automatic employment for all medical doctors, pharmacists, public health specialists and other beneficiaries of the Scholarship Scheme who studied professional courses considered critical to the state. This was made known in a statement by Fidelis Soriwei, Dickson’s Special Adviser on Media Relations, on Sunday. He said that the 107 PhD holders would be deployed in the three state-owned universities viz; the Niger Delta University, University of Africa and the Bayelsa Medical University, as lecturers. He also stated that those who obtained trainings along health related disciplines would be deployed to the various medical facilities and while others would be absorbed into the civil service respectively. Many of the other beneficiaries were from Electrical/Electronics Engineering, Agricultural Economics, Agric Engineering, International Relations, Computing and Electronics System, Gas Turbine Engineering, Natural Resources Management, Environmental Law and Management and Statistics. He noted that the State Scholarship Scheme came with heavy sacrifice and cost to the government. Good to Know. Dickson has been quite for some time now. This my governor is a funny man.he wants to act like he's working because he will soon leave sit. The cry of all the people you rendered jobless will haunt you. Congrats to the newly employed. Ebiere, l think this might be a mere press statement. Who are the people?? These guys have ran the state under water. Pensioners still remain unpaid. I stand with you. May the their cries haunt him. Lol when he's owing salaries with a small population of about 3m.This's the worst State I have been to. I'm in the State capital Yenagoa yet no light, the place is like a village, no development yet it's an oil producing State. The worst part is the high insecurity rate in the State. On my way to the State for the first time every one (about six passengers) ie after others have alighted before we started going to Yenagoa was hammering on insecurity and even sharing stories on the ones they have witnessed. You can't easily move around with Laptops, Tablets or Smartphones. You have to be extremely careful. I have not taken my laptop out since I came into the town.The shoot because of phones. Almost everything is expensive here except snails. No jobs for people. The insecurity is the major challenge. Thank you C.A, for saying nothing but the truth. I am Ijaw. I have been very shocked st the spate of development in the State. To think that it even had the number one citizen at one point makes me weak. There’s absolutely nothing to show for the billions they get. Even salaries are always slashed. Able governor,I throway salute to you. keep up the good work. Ma'am Stella live all these fake media publicity's. Na man know man dey work for the state. If you no get connect,no body go give you job.